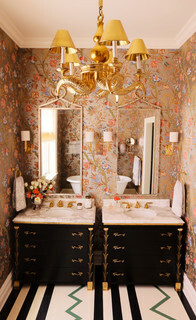 Bathrooms were originally designed to be no-frills, functional, hardworking rooms. But today's endless design layouts and fixture choices provide us with the opportunity to create a space that we can actually enjoy being in. Now, the challenge is to design a bathroom that offers the functionality of yesteryear while reflecting our personal style. No matter what size or shape of bathroom you're working with, these tips can help you add personality and luxury to your space, without compromising on practicality. Narrow bathrooms can have plenty of personality. Have fun with a smaller space like this with over-the-top wallpaper and glamorous fixtures and fittings. 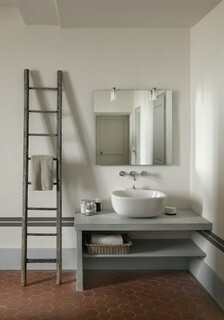 Custom vanities, like the ones in the photo, offer ample storage and style. Tip: Installing mirrored glass on at least one wall creates the illusion of space. Mirrors on opposing walls work even better. If your towel rail is on a wall where you want a mirror, work with your glass manufacturer to install the mirror around the rail. 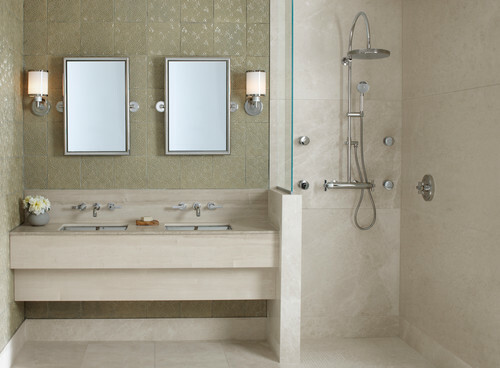 Double-duty bathrooms work hard, so put effort into designing a workable space. 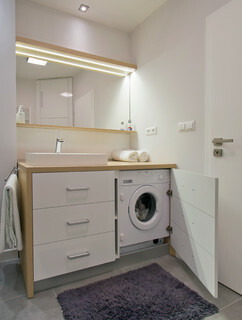 This bathroom makes good use of existing plumbing fixtures with acompact washer/dryer. Additional storage for cleaning products and clothes would be valuable, too. Tip: A standard washing machine is often deeper than standard cabinetry. Keep this in mind if you are buying a flat pack vanity and you want to hide your appliances behind a hinged door. Comfortable seating is very nice for giving yourself a pedicure or enjoying some sun and solitude. Tip: Upholstered seating fabric in bathrooms works best if it is mold resistant, so choose an outdoor fabric for these areas. If you're blessed with an extra-large bathroom, you have the opportunity to work in a healthy mix of natural and artificial lighting, zoning of major wet areas, plenty of storage and a place to sit. Tip: Try a mix of darker timbers and soft furnishings in a large space to prevent it from looking and feeling too much like a public bathroom. 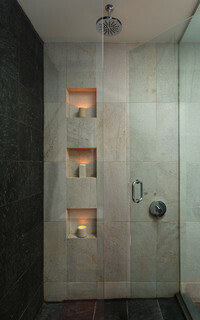 A shower niche is a practical and stylish vessel for all our necessities. A permanent tiled niche not only looks great, it won't gather mold, as a plastic hanging storage unit can. Tip: Tiling can make or break a bathroom. If you want a contemporary-looking shower, employ a craftsman tiler to miter the tiles, rather than installing prefabricated edging — this will create a seamless-looking niche. Of course, privacy is always important in a bathroom. Unlike other rooms, bathroom window treatments need to let in natural light while keeping prying eyes out. Sheer blinds are a practical option, while opaque film is a cost-effective solution. Tip: If you have the space for a luxurious bath under a window like this one, install window shades with a top-down optionto let light in without sacrificing privacy. Dual sinks are more of a necessity than a luxury in a family bathroom. They help avoid arguments and keep the morning ritual moving. Tip: A minimum of 6 feet of overall counter space is best if you are installing two sinks. Shower seating doesn't need to look like it belongs in a hospital. If you are renovating your shower, ask the builder to frame out a seat ready for tiling. In smaller showers, a corner seat will take less room. Tip: If you don't have the room or budget for built-in seating, a small stool constructed from a waterproof material like stone is a thoughtful addition to any shower. Floor heating is a popular and energy efficient way to warm bathrooms. This heating method provides an even temperature throughout the room and offers programmable thermostats. Reducing the air flow from the outside is perfect for people with allergies. Tip: Even if you're not renovating or building a new bathroom, you can put in floor heating. Some manufacturers have heat mats that can be stapled onto the subfloor or up between the joists.